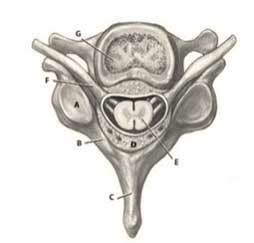 This drawing demonstrates a cervical vertebra seen from above. (A) indicates the facet joint. (B) indicates the lamina which forms the back part of the spinal canal along with (C), the spinous process. (D) indicates the ligamentum flavum. (E) indicates the spinal cord and (F) indicates a nerve root in its foramen. (G) indicates the vertebral body which forms the front margin of the spinal canal and the intervertebral disc rests on top of it. Spinal stenosis occurs once there is narrowing of the canal (E) as a result of enlarged ligaments inside the canal, enlarged facet joints (A) and when the intervertebral discs that rest on the vertebral body (G) herniates (prolapses) backwards into the canal. The spine consists of a series of vertebrae that are stacked on top of one another from the neck to the pelvis. These vertebrae are connected and kept in the correct position by the discs that are between the vertebrae and also the facet joints that interlock with one another (see the section Anatomy of the Spine). There are also supporting ligaments and tendons. The discs between the two adjacent vertebrae are composed of a central, soft, jelly-like substance called the nucleus pulposus and an outer, tougher fibrous part called the annulus fibrosus.These discs also act as shock-absorbers and maintain height between the vertebrae. As we age the nucleus dehydrates and the height between the vertebrae diminishes. The body’s response to this is the formation of bony ridges on the edge of the vertebrae, called osteophytes. These bony ridges (bone spurs) can cause compression of nerve roots and in the case of cervical spondylotic myelopathy, the spinal cord itself. In other cases the tough annulus fibrosus of the disc may tear, leaving a defect in the strong outer layer. A bit of the nucleus pulposus can then push through this tear and end up in the spinal canal and press against the nerves in the spinal canal. This can be caused by a traumatic injury, but is usually due to an inborn predisposition towards weak discs and is a degenerative disease. At the same time the facet joints at the back of the neck can undergo osteoarthritic changes. The combination of loss of height and facet joint arthritis lead to an imbalance of the neck. At the same time the arthritic changes in the joints and abnormal alignment of the spine causes local nerve and muscle irritation which leads to muscle spasm and referred pain. The combination of enlarged facet joints, disc herniation, osteophytes and spinal ligament enlargement leads to narrowing of the spinal canal. Cervical osteoarthritis and abnormal alignment is called cervical spondylosis. When the spinal canal is narrowed and the spinal cord is being compressed, it leads to dysfunction of the nerves of the spinal cord. Compression of nerve roots leaving the spinal canal causes pain in the arm(s), sensory abnormalities (feeling of pins and needles) in the arm(s) and weakness of the arm muscles supplied by those nerves. This is called a radiculopathy. The dysfunction of the spinal cord as a result of compression is called myelopathy. Myelopathy is a disease of the spinal cord that manifests as pain and weakness in the arms and also spasticity of the arms. The early manifestations can often be the inability to perform intricate tasks with the hands and fingers and stumbling when walking. It can also cause dysfunction of the nerves to the bladder and the bowel. Sometimes, because of technical factors, a CT scan is performed (see the section Tests and Scans). This is usually when an MRI scan cannot be performed due to the unavailability of an MRI scanner, when there are contra-indications to doing an MRI scan or when technical factors such as the presence of certain metal fusion apparatus in the spine, make an MRI scan unreliable. See the section Tests and Scans for the terminology that you will find on your MRI scan report and what it means in plain English. Sometimes electromyograms (EMG) are also used (see the section Tests and Scans) and this test measures the electrical conduction in nerve roots and adds to other diagnostic tests. The clinical deterioration in myelopathy can usually not be reversed but only halted. This is only achieved by surgery. Mild improvement can occur, but is not guaranteed. The treatment consists of surgical decompression of the spinal cord and the nerves that arise from the spinal cord. The operation can be from the front of the spine and these operations are called discectomies and corpectomies (see the section Anterior Cervical Discectomy) and are usually accompanied by an intervertebral fusion. Sometimes the operation is done from the back and these operations are called a laminectomy and laminoplasty (see the section Cervical Laminoplasty and Laminectomy) and they may sometimes be accompanied by a posterior spinal fusion. A posterior cervical fusion (see the section Posterior Cervical Fusion) is performed if the surgery to decompress the nerves is so extensive that it leaves the spine unstable. Managing this condition without surgery almost always leads to a progression in the symptoms of the patient. Should surgical treatment not be performed, the clinical symptoms can remain unchanged for long periods of time, but sudden deterioration can occur without warning. The surgical management carries rare, but potentially serious complications. The section Your Neck Operation contains more specific detail and you should discuss this with your specialist. Some of the most feared risks would include nerve damage, which may be damage to the nerves leaving the spinal canal or damage to the spinal cord itself. The potential effects of this could be partial or complete dysfunction of these nerves and can include numbness, pain and weakness of the muscles or complete paralysis of one or more muscle groups. Infection and the formation of blood clots are also possible complications. Speech impediments can be caused by traction or damage to certain nerves. In cases where the symptoms improve with decompressive surgery, the symptoms may reappear at some stage. In patients where the nerves have been damaged permanently, the dysfunction of the nerves (numbness, pain and weakness) may not clear up. In patients where the operation successfully treated the symptoms, ongoing spinal degeneration may lead to pathology of the adjacent (or a distant) spinal level resulting in future surgery on that level. This is believed to be a process that, even though part of the normal ageing process, is speeded up by surgery.